Few can dispute the fact that President Olusegun Obasanjo, the Ebora Owu, was one of those that brought President Muhammadu Buhari to power in 2015. 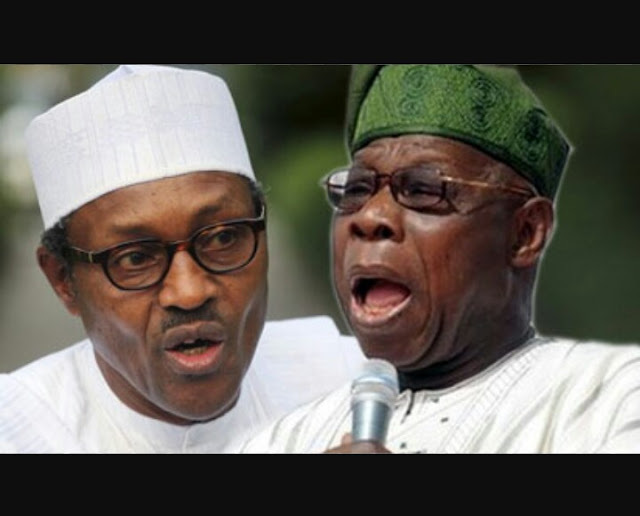 Without Obasanjo's wholesale and comprehensive endorsement Buhari would have failed woefully at the polls three years ago. Yet, in my view, today the Ebora Owu has absolved himself of this grave and monumental error by standing up to speak truth to power at great risk to his safety, fortunes and welfare and by sending our President an explosive, damning and much-awaited missive telling him that he has failed woefully, admonishing him to get off his "high horse of leadership" and advising him not to attempt to run again in 2019. I am delighted and indeed proud of what the Ebora has done and I commend and congratulate him for finding the courage to say what those of us that have been at the forefront of the struggle against President Buhari have been saying for the last three years. My friend and brother Governor Peter 'The Rock' Ayodele Fayose gallantly led the charge and said it. Pastor Reno Omokri said it. Dr. Reuben Abati said it. Professor Abubakar Sulaiman said it. Col. Abubakar 'Dangiwa' Umar said it. Governor Nyesom Wike said it. Senator Ben Murray-Bruce said it. Mujaheed Asari Dokubo said it. Mazi Nnamdi Kanu said it. Yours truly said it. And a number of others said it. And each and every one of us that did, in varying degrees, have faced all manner of insults and threats and have paid a heavy price for doing so. Yet we have no regrets because no matter what happens tomorrow posterity will judge us kindly and history will recall that, when it mattered the most, we stood for the people, for the truth, for justice and for equity and we resisted and opposed racism, ethnic hegemony, religious bigotry, naked tyranny, oppression, mass murder, genocide, ethnic cleansing and the relentless attempt to subjugate and enslave our compatriots and our nation. We welcome President Obasanjo and others to the honorable and noble ranks of conscientious dissenters, non-conformists and men of courage. Yet as refreshing and inspiring as his letter was I respectfully disagree with just one aspect of it. I believe that his categorisation and condemnation of the main opposition party was unecessarily harsh, misplaced and regrettable. And neither do I accept the assertion that the PDP "procured" a judgement at the Supreme Court. The continous attempt to demystify, demonise, demean and destroy the PDP, which the APC and the Buhari government set in motion as one of its cardinal policies three years ago, is certainly not the way forward. If anything those that got it wrong three years ago and that supported Buhari should be thanking the PDP for having the insight and fortitude to recognise the insincerity of purpose and glaring incompetence in Buhari and his APC at a very early stage when they stubbornly refused to do so. They should also be thanking a few of us for providing a viable, strong and virile opposition to a man that can best be described as a vicious and vindictive maximum dictator who has no respect for the rule of law or the tenets of democracy and a party that was contrived and conjured up from the pit of hell. Yet outside of that faux pax I believe that the Ebora Owu's intervention was not only welcome but also timely. His counsel has removed whatever little was left of the spiritual foundation of the APC and the Buhari government and it has stripped them naked before the civilised world. Today they are nothing but a sorry bunch of castrated and weakened renegades who are living on the fading glory and diminishing power of an "all-conquering" ethnic hegemonist and religious bigot. Simply put, they are nothing but a shell of their former selves. Baba Obasanjo's intervention also creates the potential for a new beginning and a massive and purposeful realignment of political forces that may end up saving Nigeria. Let us hope that thousands of others that have hitherto been hiding under their beds out of fear of Buhari will follow the Ebora's lead and find their voice. Yet if we really want to ensure that Buhari does not return in 2019 we need to go much further than offering wise counsel or letter-writing. The truth of the matter is that this whole issue goes far beyond party politics: it is a struggle between the forces of light and the forces of darkness. I say this because what we are faced with is pure tyranny and unadulterated evil. As a matter of fact it is probably the greatest evil that we have ever known in our entire history. Quite apart from the sheer duplicity, double-speak, greed, mendacities, double-standards, nepotism, ethnic and religious motivations, clanishness, cruelty, incompetence and monumental corruption of the Buhari administration, under their watch more people have been slaughtered by the security forces and by state-supported and protected ethnic militias like the Fulani terrorists and herdsmen than at ANY other time in our history outside the civil war. Too much blood has been shed. Too much suffering and devastation has been wrought and inflicted. Too much has gone wrong. The very root of our foundation and our source of strength and unity has been tampered with and damaged almost irreversably over the last three years. Worse still is the fact that the neo-fascist forces that Buhari and those that are still with him represent will not let go of power without a hard and bloody fight. Those forces are far more entrenched, determined, bloody-minded, dangerous and devastating than anything we have ever known or that we have ever been confronted with in our entire history. They are not only ruthless but they are also relentless. If anyone doubts that they should read the words of the Minister of Defence when he attempted to defend, justify and rationalise the activities of the Fulani herdsmen. I said this during the 2015 Presidential campaign and many refused to listen. I am saying it again today. Buhari and those behind him will not go down without a fight yet they must be stopped before they soak the whole of Nigeria in innocent blood and shatter whatever little is left of our fragile unity. They must be stopped before they ignite a second civil war in which brother will kill brother and to which there will be no end. We must avoid this at all costs and we must settle our many differences in a peaceful and civilised way through dialogue, fair play, justice, restraint, understanding, free and fair elections and, most important of all, the restructuring of our nation. We must also be ready to confront the tyranny in the land and face down the evil wherever and whenever it raises its ugly head. "Buhari's legacy of bigotry and ethnic hatred is set in stone. There is no amount of makeover under the sun that can change that. Fulani herdsmen set a 150-acre palm plantation ablaze in Oyo state". "I love the Fulanis! Our political scientists take time to study Machiavelli, Gramsci, Shaka the Zulu, Hans Morganthau's 'Power', Guevara et al ignoring a rare and unique political philosophy in our midst- "the Fulanism-Jihadism!" See how they took Hausa land, took Ilorin, used and dumped Ken Saro Wiwa, used the Tivs, Igalas, Idoma's et al and dumped them. Unongo is now a wailing wailer, David Mark has lost his voice, Gemade is lost, Audu is still somnambulistic, Fani-Kayode is screaming, Olu Falae is now a chronic wailer: learnt they visited him again yesterday. Na so life be? Now, let it be known all over southern Nigeria, that the march to dip the Koran into the Atlantic ocean has began in earnest. Any obstacle will be ruthlessly crushed. They tested the people's will by threatening to soak dogs and baboons in blood, they got their way. The killed and burnt the entire family of a Resident Electoral Commissioner nothing happened. They appointed only people from their side into their kitchen cabinet, southerners were made to justify it. They closed the Chapel on the Rock at Aso, our Christian Vice president, explained it away. They released murderous Boko Haram members, without any kind of penal measures into society, we hissed and went about our normal businesses. They paraded our people accused of corruption in handcuffs like common criminals, we kept quiet. They picked up Nnamdi Kanu, whose words pierced their conscience, exposed their plans and cried to the world; they handcuffed him, like a common criminal while Boko Haram kingpins, who have murdered hundreds, appeared in court unfettered, we only grumbled. They sent herdsmen to cause havoc in our homelands, rather than defend ourselves, we begged them to stop killing us in own ancestral homes. They pushed further by appointing only their own into the National Defence Council, something that has never happened before, not even immediately after the civil war, all we did was murmur. They took on unarmed IPOB, proscribed them, labeled them terrorists and militants, politically correct people hailed them and clapped for them. For the jihadists, it was a sign that the time has come, the time to implement the time tested strategy that worked in Ilorin, Lebanon, Turkey and several other places. Since it is now very obvious, that the people have been cowed, intimidated and politically outsmarted, it is now time to introduce the Trojan horse, under the guise of cattle colonies. They will take the people's lands, develop them with proceeds from oil, gotten from the people's land and hand them over to their people. They will move in with their families, one man to four women, each woman have at least five children, in twenty years time, they'll outnumber the Aborigines, use their numbers to get strategic political positions and declare an Islamic state. Sounds like fiction? No! That's exactly how Lebanon moved from a very popular trading and beautiful tourist country that it was, to the ruins and debris laden country that it is today. The Christians in the South have a choice, they either hand over the colonies to the Jihadists, sorry government, and convert to Islam or say "No!" to the colony project and begin to prepare for the consequences. To be forewarned, is to be forearmed! God help us". The unfolding scenario is indeed grave and it is fraught with danger. War is on the horizon and the sheer madness, greed, bloodlust and callousness of the Fulani terrorists and herdsmen coupled with the conspiratorial collaboration and criminal collusion of the Buhari administration in their unconsciable evil is stirring a retributive, wild, dangerous and uncontrollable rage in the hearts of their victims and in the communities that they consistently terrorise, burn down and subject to ethnic cleansing and genocide. That rage is like a massive volcano that is waiting to erupt and explode. And when it does not one of the perpertrators or the objects of its hate will escape the wrath of its burning lava. The message is simple and clear: "we shall not be conquered".